Memory « Global Market Insights, Inc. Favorable government legislations encouraging production of power saving semiconductor devices will benefit high-k and ALD/CVD metal precursor market. High application potential of semiconductors in mobiles, smartphones, iPhones, cars, and DTV are expected to enhance the growth prospects of the industry over the coming years. As per Global Market Insights, Inc., research study “High-k and ALD/CVD metal precursor industry size is forecast to hit USD 965 million by 2024.” Today, industry players are laying more emphasis on developing processes to form hybrid thin inorganic-organic films with the desired features to reduce production costs, thereby stimulating the demand for high-k and ALD/CVD metal precursors. High popularity of trailing edge devices supporting internet of things (IoT) technology and consumer electronics sector growth, is expected to fuel the industry trends over the coming seven years. Governments across the globe have made heavy investments in nanotechnology research, owing to its growing application across industrial and military sectors, and this is predicted to generate high avenues for high-k and CVD metal precursor industry over the coming timeframe. For instance, EU, U.S., and Japan have made investments of USD 1.2 billion, USD 3.7 billion, and USD 750 million respectively in the national nanotechnology initiative. Which technologies are expected to play a vital role in high-k and ALD/CVD metal precursor market growth? 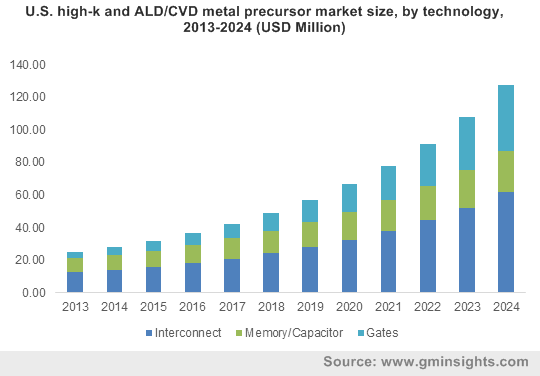 Various technologies such as gates, capacitor, and interconnect are expected to influence high-k and ALD/CVD metal precursor industry growth over the coming seven years. Interconnect technology, which had a considerable impact on the global high-k and ALD/CVD metal precursor industry share in 2015, is expected to witness a significant growth over the period of 2016-2024. Gates technology based high-k and ALD/CVD metal precursor market, which was estimated at over USD 33 million in 2015, is forecast to grow considerably over the next few years, owing to high requirement for thermal and chemical stability. How will the regional landscape shape-up over the period of 2016-2024? Asia Pacific high-k and ALD/CVD metal precursor industry growth is predicted to be driven by increasing demand for semiconductors across BRICS nations. Thailand, South Korea, and Taiwan are anticipated to offer lucrative growth avenues for the industry. In addition to this, low cost and portability of the precursors are expected to drive the regional growth over the coming seven years. Moreover, high potential for VLSI (Very Large Scale Integrated) circuit manufacturing along with the predicted increase in the number of CMOS (Complementary Metal Oxide Semiconductor) and DRAM (Dynamic Random Access Memory) applications is projected to propel Europe high-k and ALD/CVD metal precursor market size over the coming years. Germany is anticipated to be the major regional revenue contributor. North America high-k and ALD/CVD metal precursor industry revenue is expected to witness a high surge over the period of 2016-2024, driven by growing nanotechnology and microelectronics sector. U.S. is projected to contribute significantly towards the regional revenue. 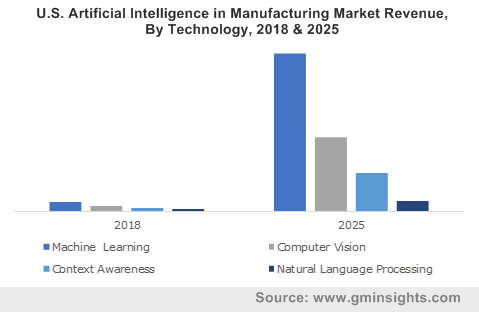 Market participants will try to improve their ROI by adopting key growth strategies such as high R & D investments, competitive pricing, product differentiation, and strategic collaborations. Key industry players include The DOW Chemical Company, Air Liquide, Adeka Corporation, ATMI Incorporated, Air Products & Chemicals Incorporation, and UP Chemical Company Limited. This entry was posted in Electronics and Media and tagged ALD/CVD Precursor Report, Capacitor, Dielectric Material, Electrode, Gates, Global High-k and ALD/CVD Metal Precursors Market, High-k & ald cvd metal precursors Market, High-k and ALD Metal Precursor, High-k and ALD/CVD Metal Precursor Market, High-k and ALD/CVD Metal Precursor Market Share, High-k and ALD/CVD Metal Precursor Market Size, Interconnect, Memory, Metal Organic Compounds, Platinum, Poly-Si.